During a concert in Barcelona last Friday, Pink Floyd’s former lead singer Roger Waters slammed the Syrian volunteer rescue group known as “The White Helmets”, calling them a “fake organisation” and accusing them of generating propaganda for “jihadists and terrorists”. 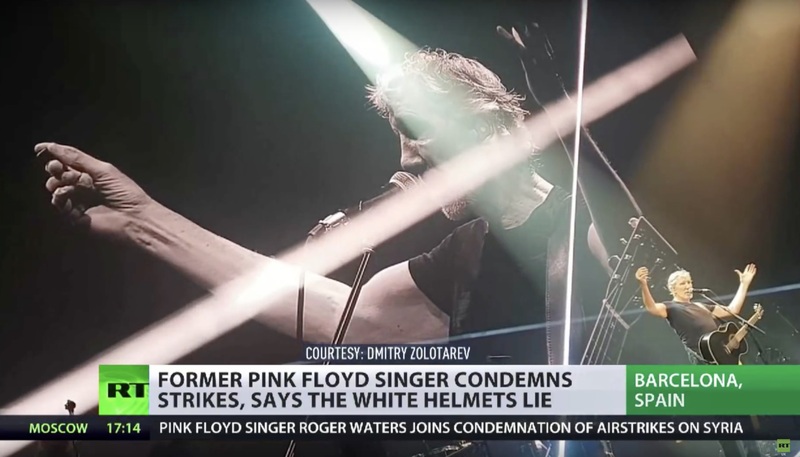 At his concert, Waters declared that he forbade a man from getting on stage and speaking on behalf of the White Helmets, claiming that as jihadist collaborators they seek to encourage us to pressure our governments to engage in military offences in Syria. In a twisted kind of logic, Waters assumes that acknowledging Assad and Russia’s crimes in the Syrian civil war inevitably means expressing support for terrorists or encouraging western coalitions to drop bombs on civilians. Thus, by warning people against the ‘propaganda’ of the White Helmets and denying last week’s chemical attack in Douma, Waters engaged in a dangerous propaganda of his own: spreading fake news regarding the conflict, tarnishing the reputation of a humanitarian organisation committed to saving innocent lives, and downplaying Assad and Russia’s role in what has by now become a bonafide genocide. There’s no denying that the situation in Syria is highly complex. Siding with any of the quarrelling factions comes with grave moral dilemmas. Amidst the senseless slaughter, and through the barrage of conflicting information, it is hard for ‘foreign’ eyes to sift through the chaos, tell right from wrong, and figure out a responsible way in which to call for action. Waters, and individuals who follow his line of thinking, disregard those complexities and the serious questions they raise: What is the obligation of the international community to the Syrian people? Is ‘hands off Syria’ the right course of action? At what price? Is there a way for international elements to intervene with minimal or zero risk to innocent Syrians? As we contemplate these questions, the guiding principle should be the concern for civilians; their safety should be at the heart of the discourse. Presently, the White Helmets remain one of the few beacons of hope and sanity in war-torn Syria. As governments, militias, and rebels engage in endless battling, members of the White Helmets sacrifice their lives on a daily basis for the sole purpose of protecting innocent lives. It is our obligation, therefore, to recognise, publicise, and support the efforts of such individuals in any way possible, regardless of our personal opinion on the conflict and our perception of what constitutes a proper response to the tragedy unfolding in Syria. Such responsibility lies even more heavily on high profile figures such as Waters, whose words echo fast and loud throughout the world, and whose message bears great impact on the minds of their audience.